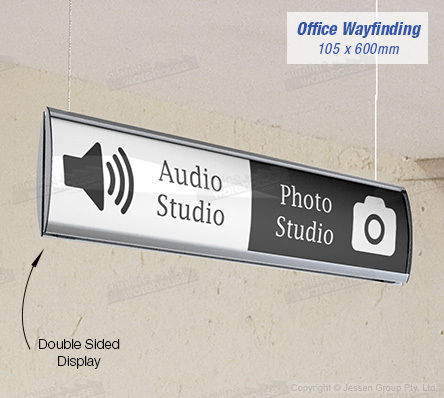 The indoor directional signs, like a wayfinding sign, uses (2) 105 x 600mm graphic holders to help visitors identify rooms and find their way in your location. The dual-sided display hangs down from the ceiling so that visitors on either side can find where they are looking for with ease. These displays are immensely helpful in locations such as exhibition halls, universities, transit stations, museums, hospitals, doctor offices, conference centres, and even shopping centres. The indoor directional signs are easy to install without a professional needed thanks to the included hardware kit. Everything you need to hang the interior signage from most ceilings is provided, as well as to attach the signs together in minutes. The 4m of nylon line that is included may be cut to fit your needs and hang the sign at the right height for best visibility. Protective lenses with each signage holder also maintain a professional look, with a suction cup tool included to easily remove these lenses for cleaning.